Value of card: "Not worth as much as these nuts," Powers said. Key 1993 stat: "Numbers are for people who don't have talent. If there's two things I have it's talent, balls and talent," Powers said. Northbound and down: Kenny Powers had been run out of Atlanta, New York and San Francisco. He was in Seattle, his career in decline. He had poisoned the media and the fans had abandoned him. His velocity was gone and he was spending money on hookers, cocaine and Budweiser at a staggering rate. 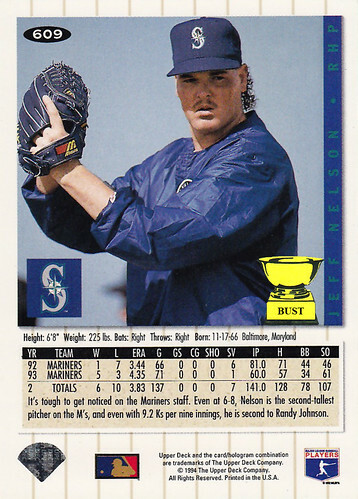 Kenny Powers needed a change, and he'd tell you: "When my (expletive) was 19 years old, I changed the face of professional baseball. I was handed the keys to the kingdom, multimillion-dollar deals, endorsements. Everyone wanted a piece of my (expletive). Just a man with a mind for victory and an arm like a (expletive) cannon. But sometimes when you bring the thunder you get lost in the storm." But Kenny Powers didn't give up. He struck out on a new road, with glory in mind. He had a vision of paradise on the diamond and he knew only the heart of a champion and the mind of a scientist would get him there. So he stole a few credit cards and an ID from some guy named Jeff Nelson, and his career, for a short time, was reborn in Seattle.